Spinal disorders encompass a spectrum of pathologies which result in either pain, deformity or paralysis to the patient. No age is spared and the need for the surgical correction of the problem crosses the barrier of age and gender. Most of the surgical procedures involve the fusion, stabilization or correction of the deformity or pathology by putting in screws in the individual vertebrae. Screw placement is fraught with inherent risk of injury to the nerves, spinal cord or blood vessels, as it is a free hand procedure based on the surgeon’s orientation of the anatomy and guided by a radiological device called C arm. The disadvantage was the lack of accuracy in these machines to detect possible injury to the vital structures in complex anatomical deformities of the spine or in patients who were already oper-ated and needed a revision surgery. Thus a need for a more accurate and safe guidance device to improve the safety levels in screw placement was increasingly felt. The concept of a monitoring and navigating device to aid the surgeon in operating on deformed and crooked spines has been developed since the late 1990s. The early systems rely on the use of reference points on the spine, which are fed into a computer which calculated the path of a safe screw in the vertebra, based on a CT scan reconstruction of the spine. This system has its own flaws and required the surgeon to navigate the spine, which makes the process cumbersome. Moreover the accuracy of such systems in large trials was suspect, as it is still a free hand procedure. This led to the development of a highly advanced state of the art technology, where a small robot aligns itself in the direction of the pedicle, which is a part of the backbone where the screws are put. The robotic arm is moved by a software which matches the preoperative high resolution CT scan of the patient’s spine with the images of the patient’s spine captured by a C-arm, which is a portable X-ray device used to see the bones during orthopedic surgery. Once the bones are matched and the individual parts are registered on the machine this aligned robotic arm guides the surgeon to place the screws in a very accurate fashion. 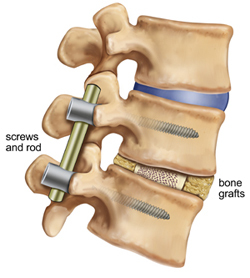 The path of the screws is planned by the surgeon on the day prior to the surgery on a computer. All the details of the surgery including the sizes of the screws and implants, number of implants and the various other angles and distances for the respective screws are programmed by the surgeon. On the day of the surgery, these details are available to the surgeon at the click of a button. This makes the whole procedure faster, safer and more accurate. The recent advances in spine surgery has included Minimally Invasive Spine Surgery, also called Keyhole surgery in common parlance. In these surgeries, the skin is not cut in great lengths on the back. The entire surgery is done through one or more small incisions the sizes of small keyholes. This gives the patient the advantage of a faster return to work and easier rehabilitation, lesser blood loss and pain. For these types of surgeries, a number of X rays are taken during the surgery to determine the correct level and the exactness of implant placement. This endangers the patient, surgeon and other operating room personnel to a lot of radiation hazards. The robotic guided surgery decreases the amount of radiation exposure by 10 times vis-à-vis a standard keyhole procedure. Ever since the Spine Surgery Unit headed by Dr Sajan Hegde conceived of getting this technology to India for the first time, it has been followed very keenly in the hospital. The robotic guidance system called Mazor Rennaisance, is developed by an Israeli company called Mazor Robotics Limited. The company sent its prog-rammers and trainers to Chennai to our Hospital to train and instruct the various theoretical and practical intricacies. An instructional course with training was given to the surgeons, OT nurses and all the other involved personnel. A dry run on bone models was carried out and once it was sure that all the systems necessary were in place, only then Dr Hegde’s team went ahead and performed the surgeries. Since the whole team was new to this procedure, a few technicians and programmers from the company came down to India along with the machine and helped in the initial few surgeries to avoid any glitches. Since its launch to date, close to 20 spine surgeries have been operated, some of which were extremely complex deformities and would have been very difficult, if not impossible to perform without guidance. One young girl, who had been operated many times on her back for her scoliosis with failures at each attempt, came to us with a desire to get operated for the deformity. During the surgery we saw that the whole of the anatomical landmarks necessary for the free hand placement of the implants was lost and there was no way the screws could have been put. It was at that time we realized the value of the robotic guided system to enable us to place the screw in the bone without any damage to the blood vessels or nerves. Another patient who was suffering from severe kyphosis (hunch-back) due to a disease called Ankylosing spondylitis was operated with a deformity correction and eventual straightening of the back. Many of the surgeries which were planned to be done in the minimally invasive way were executed with as less as 10% of the radiation in a standard C arm guided keyhole surgery. There are patients in whom the robot has been used to obtain tissue for biopsy from an exact preplanned location, as in the case of an elderly woman with breast malignancy and metastases to the spinal column. Another useful instance has been in a middle aged lady who had a severe scar on her back due to a previous burn. This lady came to us with infection of the backbone and incomplete paralysis of the lower limbs. Since the skin of the back did not permit a standard open back surgery, a keyhole stabilization was done beautifully using the robot. Planning and executing of this project was both technically and logistically difficult. There were initial teething problems in getting everything to fall in its place. The time taken in the initial surgeries was slightly long. But the learning curve became shorter with each case. Once all the participants in the surgery were familiar with the procedure of the robot, the surg-ical times decreased drastically. Also the understanding of the system improved and hence a smooth flow was seen in the oper-ation theatre in the subsequent cases. This technology (Rennaissance, Mazor) has helped us to achieve accuracy levels as high as 98% compared to a standard free hand accuracy which rarely exceeds 90 percent. More so in the scenario of a very complex deformity in young adults or children where the risk of improper and dangerous surgery is high, the robot has assured the surgeon and the patient with the high safety levels it provides. Though the instrument is expensive and requires the use of a certain amount of disposables each time, the actual cost incurred to the patient rarely exceeds an additional 20 percent on the total expenses for the surgery. The patient can be comfortable knowing that the surgery planned is a highly accurate one and that there is no scope for any untoward complication. Thus the benefits compared to the extra cost involved are high enough to take this up. With respect to the hospital, we can be proud that we are the first hospital to introduce this technology in Asia (outside of Israel ), beating countries like China , Singapore , Japanand Korea to the mark. This has helped brand our hospital as a pioneer in the safe management of complex and otherwise dangerous spinal deformities. As of date, we have patients from other countries too who have been operated using this state of the art technology. This bears testimonial to our superiority in technology advancement in the field of spine surgery, making our hospital one among the top centers in the world. The operating room personnel too are benefitted as the radiation exposure due to an image intensifier is reduced to miniscule proportions. The surgeon and his team, at the end of the day, return home with the satisfaction of having done an accurate and safe surgery. At the same time we would like to also mention that the surgery as such is normal as a conventional surgery, but the robot finds the safest possible path. 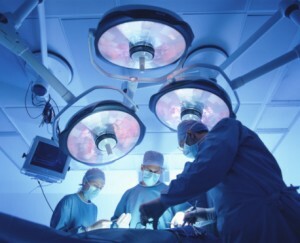 In that sense the robot does not replace the surgeon, as is the normal misconception. On the contrary, the surgeon is backed up by the foolproof planning done prior to the surgery on the robotic software. Our review of all the patients operated has been excellent and we can confidently assert that the robotic guided surgery has made spine surgery a safer proposition, in addition to reducing the stress on the surgeon and his team in the operation theater. The future of spine surgery is shaping in the direction of minimally invasive surgeries where the stress shall be on earlier return to productive activity to the patient and reduction of the hospital stay and expenses. From the surgeon’s perspective too, the use of the robotic guiding systems would mean more safety levels, lesser radiation hazards and stress free situations in the operating room. Technology is ever advancing and it is the duty of the medical fraternity to keep abreast with it as the patient has the right to benefit from every such advancement.